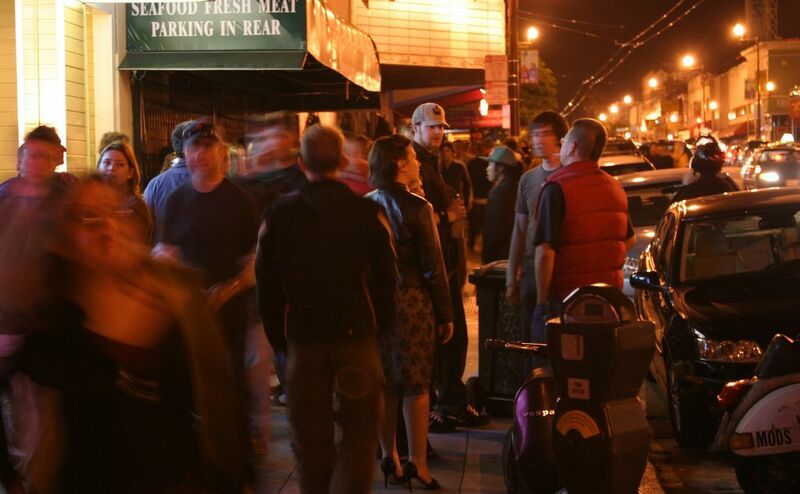 When was the last time you went to a bar, lounge or club in Oakland and had to wait in line to get in?? Maybe I need to get out more? I recall doing that in SF back in the day but never here. Everyone from the Bay comes to Downtown Oakland now – from Hercules, Rockridge, Walnut Creek, Berkeley, San Francisco, Hayward….and yes there were lines last night, at Somar Bar and Era Art Bar and Lounge among other spots. It’s Friday and I’m going out on a limb. Here’s my deconstruction of yesterday’s mostly accurate AP socio-economic snapshot of our fair city. Let me know if I’m missing or misconstruing anything. On the other hand, the writers take without a grain of salt the Mayor’s proposed solutions. They also make no note of his shortcomings – such as his famously low work hours. They also make no mention of the continued allegations of nepotismo that Mayor Dellums seems to enable at City Hall, that I have read about time and again at A Better Oakland. I’ll discuss what the AP guys missed or got half-right, below. Some of Oakland’s Alleged City Hall Nepotisms: The Mayor spent $100k of our tax money to conduct a national manhunt for a new City Administrator after the Deborah Edgerly slow-firing bowel movement. In the end he signed up his long-time FRIEND Dan Lindheim who has no relevant work experience (PDF!). Allegedly, the qualified candidate Robert Bobb, per opinions stated at ABO, RockridgeResidents and elsewhere, didn’t want to deal with INTERFERENCE from Dellum’s “shadow mayor” wife Cynthia. Sorry about the All-Caps, but I’ve written to my councilmembers asking that they request the results of this $100k candidate search and gotten nothing. No published results. No answers. Who got the dough and what did it produce? Nitpick – it was $2.6 billion. Excuse me for being quaint. I forget that Trillion is the new Billion. “Thousands of green jobs” – Sorry. I just reviewed the Mayor’s stimulus funding request through US Conference of Mayors, and there aren’t “thousands” of green jobs. The total jobs created number is 3,400. There are plenty of non-green jobs: dredging the Port’s harbor to be 50 feet deep, spending $2.5MM on a new helicopter (creates “30 jobs” how? ), installing surveillance cameras at Eastmont PD and laying out cash for more gas-powered Crown Vics. The AP tagteam writes that Oakland’s unemployment rate is 14%. This is according to the State of California. I don’t know if they do their math better than the feds — I would hope so. If not, well then, read below for why our rate may be even higher. This may be a bit of a stretch. If you know anything about federal statistics, you know that BLS in the 1990s changed the way it calculates unemployment such that a minimum of 7% of people unemployed are no longer counted. Thank you, Former President Bill Clinton. Read a full explanation of how/why over at John Williams’ “Shadow Government Statistics” website. With this in mind, we should add 7-10% to Oakland’s unemployment rate for a true assessment. If accurate, this would mean that Oakland’s real unemployment rate is between 21% and 24% — nearly the First Great Depression amount of 25%. Time to start picking apples! Dellums’ late 90s military base closings account for some of the long-term job losses; the rest can be equated with the long national march of offshored jobs in manufacturing (China now has the world’s largest “Middle Class”), the end of WWII shipbuilding (Kaiser shipyards), and general “white flight” to the Suburbs due to Oakland’s perceived and actual crime problems. I’ve seen one black family selling hot dogs out of a cart in front off the Uptown Night Club which they bring in on a pickup truck. Smart move, and reminds me of all the hotdog and khebab carts in NYC. There are also two new pedicab (bike taxi) services in DTO. It will be interesting to see if Oakland’s crime problems recede with a new Police Chief, police management strategy, and any wrap-up of alleged corruption and collusion with criminals. Some of this relates to the Black Muslim Bakery-Chauncey Bailey case; the rest deals with “geographic policing” and the low morale of 12-hour days, chronic understaffing, and other problems outlined elsewhere. Increased public safety would create a welcoming atmosphere for more Higher-Income Residents, Redevelopment, Tourism and New Businesses to flourish, thus adding more local jobs and reducing our unemployment rate. That is my theory anyway, and probably the theory of most Oaklanders and city politicians. It doesn’t help our economy that many businesses are on hold, closing or have closed (Parkway, car dealers, restaurants, housing and commercial development projects) but in the long view, many of these were unsustainable anyway. I’m not going to discuss the city budget here because V Smoothe does a better job of it. Soothe to say, like thousands of other US cities, Oakland will be cutting its staff and programs. It’s inevitable. Cleveland did its round of firing and freezes in 2006 as soon as the housing bubble peaked, and is now sitting pretty. In a macro sense, I’m still amazed at the people who predicted that President Obama would be little more than an economic janitor. No wonder the Army’s ending its Stop-Loss program – they don’t need it anymore.